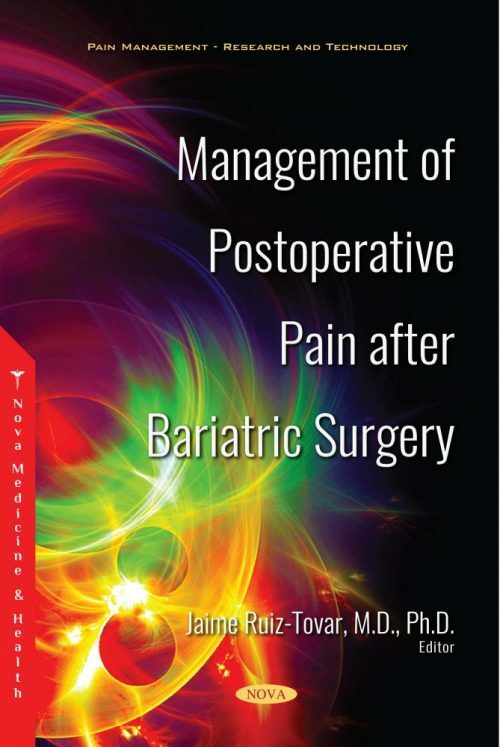 Patients undergoing bariatric surgery are special subjects, as they present different conditions that make it more difficult to facilitate correct postoperative management. A medical staff is often not used to managing these patients and they do not consider that different measures or doses of drugs should be employed. Moreover, several approaches performed in the general population cannot be offered to morbidly obese subjects because of their particular anatomical conditions. The correct management of postoperative pain is essential for the adequate evolution in a postoperative course, as a patient experiencing pain will not be able to mobilize. Moreover, analgesic resources are usually morphic drugs, which might cause nausea and vomiting, impeding correct oral intake. Multimodal analgesia is actually considered the gold standard for postoperative pain control after bariatric surgery, implying the administration of drugs or performance of different analgesic or anesthetic techniques in order to reduce the need for postoperative morphine. For the correct application of postoperative analgesia, it is essential to know the physiopathology of postoperative pain and the mechanism of action for each analgesic technique. Professionals: Bariatric surgeons, Anesthesiologists, General practitioners, Nurses and Medical students. Industry: Medical industry of laparoscopic devices (Medtronic, Johnson&Johnson), industries commercializing analgesic, anesthetic or antibiotic drugs (MSD, Bayer,…). Non-professionals: Obesity and diabetic blogs and chats.